Jawaharlal Nehru University(JNU) is counted amongst the top universities in India with its centres across the country which makes it a perfect national university. It’s a dream of almost every student to get admission in JNU because of the various courses it provides in national and foreign languages. Also the admission is not that easy in JNU, one has to give entrance exam for the specific program applied for. US $ 750 per semester for all the courses in science field. US $ 500 per semester for all the courses in humanities field and social sciences. US $ 100 per semester will be charged from both the above mentioned categories. The student can pay his/her fees by depositing the cash in any branch of State Bank of India which should be CBS enabled. First you have to visit the site by click here, here you have to select the appropriate fee payment link which is application fee and now just select the Cash Deposit at bank (E Slip) as your payment mode. Print your E Slip and deposit your fee payment at bank on the next working day of printing the E Slip. The payment status will be updated on the JNU website after 48 hours. The students can pay their application fees online through any of the debit card or credit card of any bank. The students can also pay their application fees through internet banking of State Bank of India and for other banks will be start soon. Cash Challan: Rs.60 and the taxes charged per transaction. State Bank of India Debit Card: Rs.10 and the taxes charged per transaction. Other banks Debit Card or all other banks credit card: Transaction fees applied by the respective bank and the taxes charged by the bank. State Bank of India Internet Banking: Rs.10 and the taxes charged per transaction. Other bank’s internet banking: Transaction fees applied by the respective bank and the taxes charged by the bank. 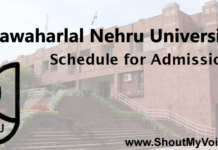 For more information regarding the fees structure, admission details, courses offered, entrance exam and eligibility criteria of Jawaharlal Nehru University you can visit site. Also if you find this article useful, then please don’t forget to share this with your friends and family.